﻿ KWVA Citrus 192 participated in an Independence Day presentation entitled "Celebrating Freedom," an annual program by the First Baptist Church in Crystal River, FL. Members of KWVA Citrus 192 participated in an Independence Day presentation entitled "Celebrating Freedom," an annual program by the First Baptist Church in Crystal River, FL. We presented the Army, Navy, Marine Corps, Air Force, and Coast Guard flags during the one hour program. 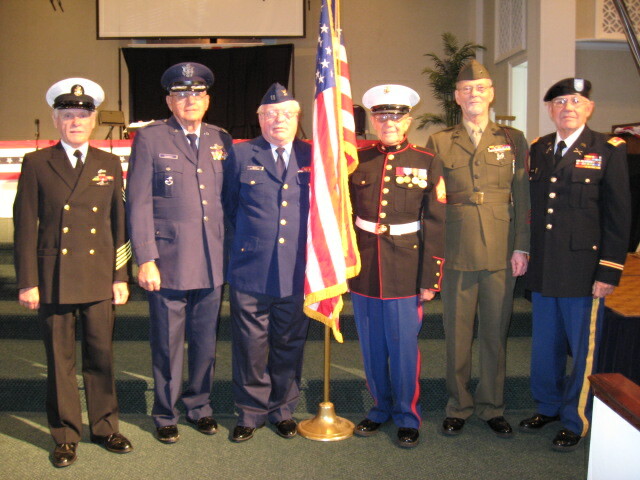 Standing left to right are: Navy CPO Reggie Thurlow; Air Force COL Jim Hembree; Coast Guard LT Kerry Keith; Marine Corps SGT.Chuck Spikes (First Vice Commander-KWVA Citrus 192); Marine Corps SGT Walt Malowski; US Army LTC Hank Butler (Commander KWVA Citrus 192).